The Wichita State signee had an outstanding senior season in which she his .696 over 25 games with 39 hits, 60 RBI, eight doubles, 15 homers, despite being walked 39 times. She only struck out three times all season and had a .825 on base percentage and 1.642 slugging percentage. She only committed one error all season and was also 8-1 in 12 appearances in the circle as a pitcher. The Shawnee Heights Booster Club would like to congratulate the T-Birds on all of their success. Congrats on another 5A state title! 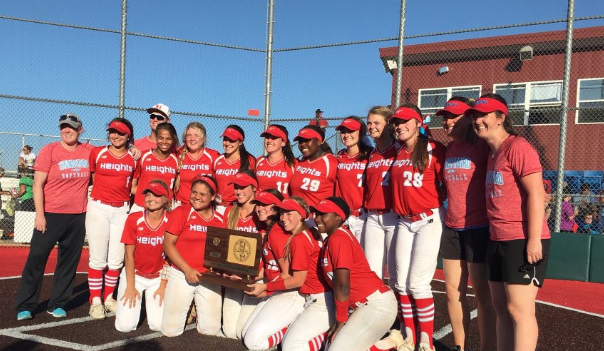 Proud to supporter Shawnee Heights Softball! After being an assistant for 15 years at 6A power Washburn Rural and then one season at Washburn University, Griffith was hired at nearby rival program Shawnee Heights in August 2017 replacing Steve Giddens who just came off a perfect 25-0 season. Griffith had huge shoes to fill and followed the footsteps perfectly, going 25-0 and winning another 5A state title. Shawnee Heights has now won undefeated titles back to back in 5A with a loaded cast of players, six which made first team all-state in 2018. They have won 50 straight softball games in a loaded league and loaded classification. Her team was very disciplined at the plate hitting .452 and only striking out 54 times in 25 games. Her pitching staff only allowed 21 earned runs throughout the season as well. Shawnee Heights isn't going anywhere anytime soon as a loaded cast of players return again in 2019. Aniya Holt, Shawnee Heights Soph.